I’m not going to apologize for taking so long to blog again. I think we can just accept that I’ve been avoiding something that is important to my writing career. My old idea that all I have to do is write good books (which I do!) is totally unrealistic in this new world of digital publishing. Not gonna work! So, I’m leaping in with both feet. A few years ago, I received the rights back on my first book, the one that was published as a Silhouette Desire. My title was CHRISTMAS BONUS since my heroine and hero made love after the office Christmas party and got a little “bonus” nine months later. Since the book came out in May, Desire changed the title to BABY BONUS and it made the USA Today Bestselling list. It was published under the author name of Amanda Kramer, but Desire never bought another book from me. Meanwhile, my second and third book were sold to Hard Shell Word Factory with the author name of Jackie Kramer. Then, they published my time-travel novella and Mundania.com published my first S/F short story, also under Jackie Kramer. It dawned on me that I was basically selling stuff in a shotgun manner. I learned about branding, reader expectation, and tagging. Yikes! I was running around like a sehlet with it’s head cut off. (A little Star Trek joke there.) So the first thing I did was get the rights back on BABY BONUS so I could retire the name Amanda Kramer. I had my name legally changed to Jackie Kramer (Got rid of the ex-husband’s name which few people could spell anyway! ), and split my writing personas into Jackie Kramer for romance and J’Anne Kramer for my SF. At the same time, my SF short story went out of print, so I have the rights back on it. Now, I’ve got all my ducks in a row; I’m ready to go. Relax. In future blogs, I’ll be making you a partner in my journey. And we’re not going to miss a single professional step. You’ll be introduced to a crazy, exciting new world. Paraphrasing a great lady…Fasten your seatbelts. it’s gonna be a wild and bumpy ride! I’m now officially part-time in nursing. I’ll be working three 8 hours shifts, 3-11PM. I still love nursing, but after 30 years, it’s getting harder to chase down hot three year olds and stuff Tylenol down them! I consider myself semi-retired and with all this extra time on my hands, I’m also changing my writing life. Before when I wrote, I was productive in the summer and fall, but due to the hectic pace of my “other” job, I often didn’t get a lot done in the winter. So, what am I doing now? Am I working on my MIP? Yes, I am, but most of focus this month will be on NaNoMo. That stands for National Novel Month. It’s an annual national challenge that writers put themselves through each November. Each writer vows to write 50,000 words in 30 days. By the end of it, you will have a novel. Not necessarily a novel ready to pitch to an editor, but hopefully a complete story. I figured with the way my schedule, personal and writing, has been so chaotic lately, I knew I needed something to help me get back into the writing every day. I also need to teach myself to treat my writing as a job, so from now on, mornings are mine. I won’t answer the phone. I won’t make any appointments for the morning. And I definitely WON’T read before I finish my writing…not the newspaper, not the book I’m into, not even my cereal box while I’m eating breakfast. Another goal of this challenge is to avoid my inner editor. In fact, at the NaNoMo kick-off, I locked the b*tch away! And today was the first day. I don’t have a synopsis yet. Most of the time, a novel has to “cook” in my head for a couple of years before I start writing. This time, I’ve had the idea for three weeks. But I do have the first chapter and half the second blocked out. Also,I’m writing in one file. I’ll still have chapters, but I’m keeping the beast in one place. And you, my faithful readers, will get to hear ALL about my journey. Today, I got 1700 words done; I’m psyched! But I’m realistic enough to realize that it may not go so well down the road, so any encouragement from you will be very welcomed! And check back frequently. I may not post daily, but part of my “New Year’s” resolutions is to be better with this blog. Hope you won’t be bored. For the first time in half a century, whooping cough is back. California alone has had 2,700 cases. It’s a nasty disease for youngsters, but is life-threatening for infants. CA has also had seven babies die of the malady. There is a vaccine for it, but it can’t be given until 2 months of age and can take all the way to five years old to totally protect some kids. So why are we seeing so much nowadays? It’s not totally because kids aren’t being immunized, though a lot of kids aren’t protected. Much of the new disease is hitting young adults and older who WERE vaccinated but their coverage has lapsed. They get the disease, but because their airway is larger and because their cases are often milder due to past injections, they don’t get as sick. But they pass the infection along to the under covered or unvaccinated. So here is my plea. If you have ANY contact with young children (2 and under), please, PLEASE! Not only immunize your kids, but talk to your doctor about getting a booster for yourself and the other adults in the family. Remember, the baby you help may be….well, it doesn’t matter. Isn’t being safe to any baby around you worth a tiny stick? Bet your doctor will give you a sucker if you’re a big person and don’t cry. Please help us get this once almost wiped-out disease back on the road to extinction. A few weeks ago, my car was rear-ended for the second timed in 18 months…the third time in five years! Is there an invisible sign on the back of my cars that says “Hit Me!”??? This time, the car was totalled. Luckily, the other driver’s insurance, State Farm, has been fantastic! So much different from Metropolitan Life, the insurance company I had to deal with 18 moths ago. When I got home after the accident, State Farm already had a message on my machine, starting the process. 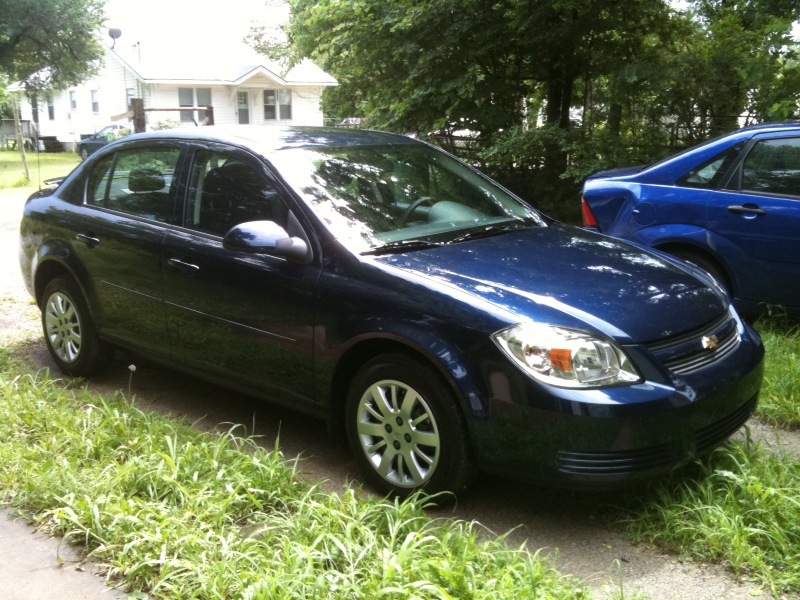 My old car was drivable and after I paid off the note, I was going to save up for a nice downpayment on a new car. Because I’ve never been really crazy about my Ford Focus, I was going to take my time looking for another car. But my DIL had other plans. She didn’t like the idea that if I got hit again (A possiblility since that seems to happen to me a lot! ), I might get hurt this time. So, she got a list of what I wanted in a car and went hunting. Withing a week, she’d found a 2010 Chevy Cobalt. I went to look at it, but didn’t think I’d find something I really like that quickly. I loved it. From the minute I test drove it, I wanted it. I loved the color. I loved the way it handled. I loved the fit. I didn’t even really know how much I DIDN’T like my other car until I drove this one. So, now I’m a happy camper. I’m once again in a car I can enjoy for a long time. OMG! I should have gotten an iPhone years ago. That’s why I haven’t blogged lately. I’ve been learning to use my iPhone. I’ve learned to text, bought apps, read a book, set up my iPod part, and am now in the middle of a game of Words With Friends…with a random opponent who is very good. You have to understand. I have a long time history of “machinery deficiency”. I like to put it that machines and I have been at war for decades. If there is any way to break it by using it correctly, I’ll do it. So for me to enjoy any device is astounding. But with my iPhone, I can email, text, play games, send money per Pay Pal, read books, magazines, and newspapers. I also have a pet; a parrot fish called Jake. and I can play the piano, find lyrics to songs as they play. I can get Amber Alerts, weather alerts, and find a pet. Oh, and I can make phone calls. Yep, it’s my 65th birthday today. When I was a kid, I never figured I’d live this long. After all, 65 is sooo old! Ha! Now, I think 100 is old. I’m at Conestoga, a local SF convention. For my birthday, I treated myself to a weekend off from work. By providence, my state tax return came in so I have money to buy to my heart’s content. I won’t, but it’s nice to have it available. I also ordered room service for breakfast. What luxury. It’s time to go. More stuff at the con and I’m on a panel this afternoon. Happy birthday to me! And many more.